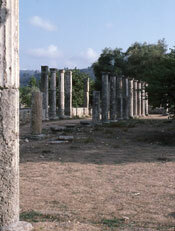 Olympia was a rural sanctuary in the Western Peloponnesos dedicated to Zeus. It was located 15 km. (7 miles) from the Ionian Sea. The sanctuary was located near the meeting of the Alpheus and Kladeos rivers at the base of the Hill of Kronos.